A common problem that probably every cake decorator has had to deal with at one time or another is when a cake forms bulges after coating it with rolling fondant. This is an especially important issue when making wedding cakes because you really want to have your cakes smooth and straight. I wanted to share some quick tips on how I overcome these issues. I am sure there are many other ways to take care of bulges on your cake but this is how I have tackled this problem for the last 10 years at Yeners Cakes. Air bubbles and bumps can have some pretty detrimental effect on your masterpiece, especially if its a wedding masterpiece. As the topic of this article is to deal with the air bubbles, I won’t go into any details on ’how to coat a cake with fondant. Through out this entire process, what helps me a lot is that I only switch on lights on one side of my room at work, and the other side has no lights. The purpose of this is to cast shadows, so you can see the bulges a lot more easily. Ive taken two pictures to show you what a difference it can make. Of course I am speaking from my own experience, and it depends on your specific environment. This may not even be an issue for you, but in my work place, it is quite bright and when theres lights coming from all around you, theres no shadows, and when theres no shadows, it’s very easy to miss some air bubbles. Left: A bulge shown with multiple light sources. Right: A bulge shown with one light source. 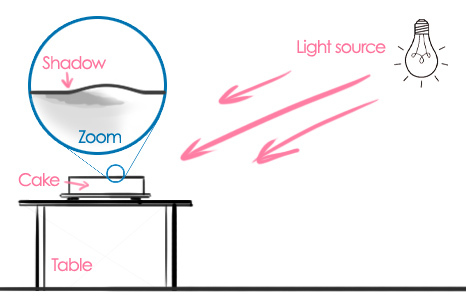 Diagram showing a single light source allowing it to cast shadows of the bulges on to the cake. There are a few types of bulging that can occur. I will outline them and provide my solutions. This can happen in a couple of ways. One way is while kneading the fondant air bubbles can get trapped inside the fondant. I get rid of these air bubbles before I place the rolled out fondant over the cake. So when I am rolling and flattening the fondant out, I remove these air bubbles with a pin/needle. The thinner the needle the better so it leaves less of a noticeable hole on the cake. 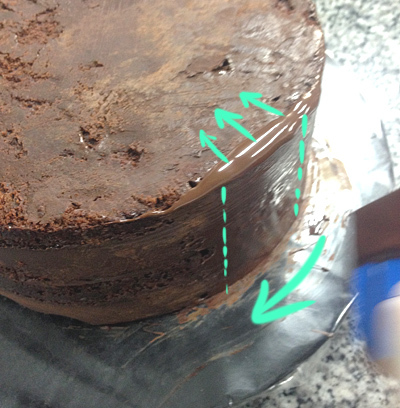 A good way to avoid leaving a mark on the cake is by poking the hole from a low angle. 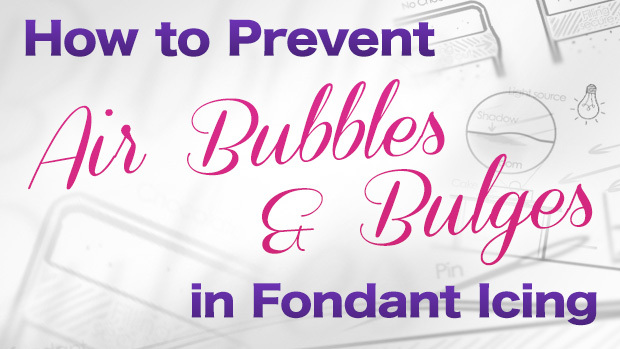 To remove air bubbles from within the fondant before placing it on the cake. It’s a good idea to remove as many of these air bubbles before you cover the cake with the icing. If you cover the cake with the icing, and you start using a cake smoother and pushing on the icing, as the bubble tries to escape, it will cause the icing to stretch away form the air bubble. Then, later on, if you poke these air bubbles with the pin after coating the cake, because you pushed on it already, the icing in that area is thinner leaving you with indentations, like craters on the moon. Not good. Another cause of bulging is air getting trapped between the fondant and the cake. Fixing this is pretty much the same as the first type above. What I do is unroll the fondant over the cake, then without touching the fondant around the sides, start with the top surface of the cake and use a cake smoother to flatten it down. Push outwards from the centre so you push the air bubbles out from the surface before you push the fondant down around the edges and sides of the cake. If theres any air bubbles that I can see, I will use a pin or just lift up the sides and push the air bubble out. To remove air bubbles from under the fondant after placing it on the cake. After the top is flat, I slowly work my way around the edge, pushing the fondant down around the sides of the cake. Using the cake smoother, I start from one side, and work my way around, pushing the air bubbles in the same direction and poking the pin to remove them as I go. I just do about 5cm’s at a time so I’m not trying to push air bubbles too far. After I’ve gone all the way around the cake, I use a rubber scraper and give it a few more laps around the cake making sure I didn’t miss any. This step is where the lighting is really going to matter. Having that one sided lighting is really going to make it easier to see the bubbles. Also, keep turning your cake around and looking at it from different angles. If air bubbles are left under the fondant, they may expand as the cake slowly reaches room temperature and gets softer. Then you may end up with a big golf ball sized bump on your cake that can also be very difficult to fix if your rolling fondant has dried up. I always coat my cakes straight out of the fridge so they are nice and firm to push against while coating. Because of this, the cake makes its transition to room temperature while its coated with fondant. So that I have the freedom to eliminate any bubbles I may have missed that may expand later on, I always wrap my freshly coated cake with cling wrap and let it settle into room temperature for at least an hour or two. If there is an expansion of an air bubble, the cling wrap helps to keep the fondant soft so that I can just poke a hole into the bubble and push the air out with a cake smoother. What you don’t want to do is start decorating your cake immediately after coating it with icing. If you stick on any sugar items, a ribbon, do intricate piping etc, you will get very upset when all that hard work is on top of an expanding bulge. If it so happens that you thought you removed all the air bubbles, left your cake to settle and come back to discover a massive extrusion on the side of your cake that is too dry to remove without cracking the icing, you may be able to cover it up with the use of decorations such as ribbons, piping, ornaments etc. Although, whether this is possible will of course depend on the design of the cake. If you can’t cover it up with decorations, you can use a scraper to scrape some royal icing over the cracks. This isn’t the best way as you will probably still see a differentiation between the royal icing and the fondant, but its the next best thing after re-doing the whole lot from scratch. This one is much more difficult to fix because the bulge is not cause by air that you can just poke a hole at and remove. This problem will be more apparent with cakes with a softer and more liquid filling. 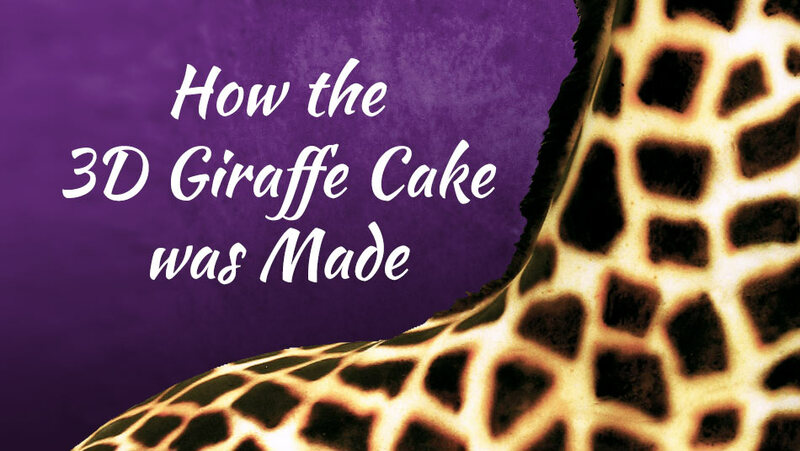 It is mainly cause by gravity so this problem usually occurs because either the filling is really soft, or the cake is really high and too much weight is pushing down onto the filling…or both. What I do do avoid this type of bulge is this. Before I mask the cake, I will scrape a layer of chocolate around the sides of the cake. This can be a tricky and messy task if you haven’t got any experience with it and it may take a bit of practice. Just make sure you keep the surface smooth so there aren’t any little bumps when we are masking the cake with ganache later on. Left: No chocolate coating. Right: Chocolate coating prevents the bulge from pushing out. So I will get some melted chocolate, then dip one side of a scraper in the chocolate, and scrape it on the cake. Again, just small sections at a time. Repeat this until the whole cake (or more importantly, just the sides) is covered with a few millimetres of chocolate. You can leave the top without chocolate but I like to do the whole cake so it is stronger, especially with tiered cakes as the extra strength comes in handy when handling and stacking the cakes. Be careful not to apply too much chocolate at one time. If you want to make the chocolate thicker, apply a little first, and wait till it dries, then apply more. As the chocolate dries, it contracts a little in size, and if its too thick, it will crack. Depending on the size of the crack, it wont be too big of an issue and the chocolate will still serve its purpose (stop the filling from pushing out). If cracks are too big, just fill them up with a bit more chocolate. Use a straight scraper and dip one side of it in chocolate by holding it at an angle. Spread the chocolate on the scraper onto the cake and only do a small section with each stroke. Fix any cracks after the chocolate has set. Essentially we are creating a hard shell around the cake so that the soft butter cream, ganache or whatever filling you are using, is not going to soften up and get squeezed out the sides, causing the bulge. It will be stopped by this chocolate dam 🙂 I do this with almost every wedding cake tier I make that is 75mm high or more. It depends on your filling though. If you have a really soft cake thats only 5cm high, maybe you still want to take this precaution. 95% of the time, I deal with mud cake and it is never a problem with cakes that are only 5cm high. Another way to prevent this type of bulge around the cake is to pipe a circular dam near the edge of the cake (like this) and put the filling within that wall. I have seen some people discuss this on various tutorials online but personally I have never had to do this (other than when I was studying at TAFE) method because I mostly deal with mud cake and ganache as the filling. If you coat a cake and have this problem, you may still be able to fix it, or reduce it at worst. When this rim bulge happened to us one day, we used a thick ribbon (higher then the cake) and wrapped the ribbon around the cake tightly and sticky taped it, kind of like a belt. Then waited till the icing was completely dry and the cake had reached room temperature. After removing the ribbon, the fondant was dry and strong enough to act as a dam and hold stop the bulging. It probably won’t be a 100% fix but it will surely make an improvement if you are facing this problem. So thats it! Pretty simple ways that I have been using for years to eliminate this annoying problem. 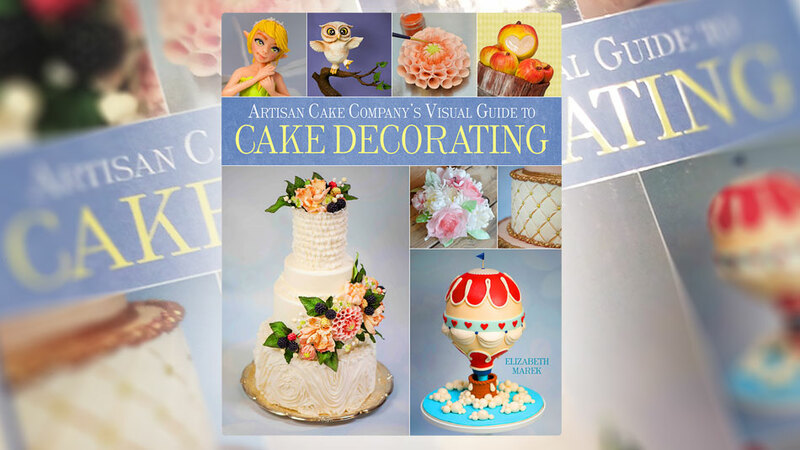 I hope this article was helpful to someone and if anyone knows any other ways to prevent air bubbles and bulging when coating cakes with fondant, feel free to post in the comment section below. Your buttercream recipe is divine…THANK YOU! If I use the original recipe, is it good to cover the cake before the fondant (i.e. will it be firm enough so I can smooth out the fondant etc.)? At what time do you suggest I add color to the mixture, if I want it colored? Does it make any difference if it’s liquid or gel? I wanted to know when do we shower the cake with simple syrup and when don’t we. Because I have watched a lot of videos on YouTube and I see that there are chefs who use simple syrup and others don’t. It is very hot and humid where I live and I have found that when I try to cover a refrigerated buttercream cake with fondant, it becomes tacky so quickly, its almost impossible to smooth it over the cake. I would like to switch to chocolate ganache instead. Will this allow me to cover cakes at room temperature? If this is possible, please can you tell me what would be the best way to ensure the fondant adheres to the cake? hi Yener, i love your pastillage recipe and i have been using it for a while now with no problems . thank you. i live in Lagos Nigeria and here its quite hot and humid and was wondering if ganache will work for cakes in this climate. 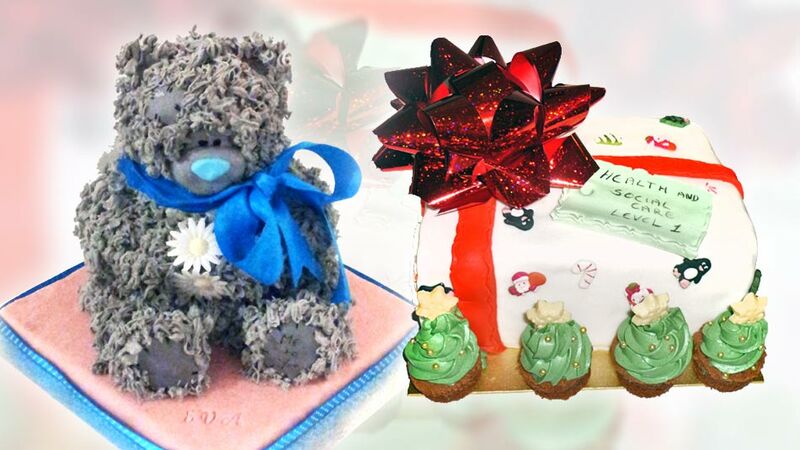 secondly please can you give us a good fondant recipe thank you. Ganache recipe is always works regardless to humidity you can increase the chocolate ratio for warmer rooms. For Rose: the shortening will prevent the buttercream from firming up fully. In the UK we use ONLY unsalted butter which sets in the fridge after filling or crumb coating. Swiss meringue buttercream will set even better. Thank you so much for sharing your knowledge and expertise!! I am new to cake decorating and faced these problems with my first wedding cake. So the chocolate shell is a great tip!! I do have a ? My buttercream always seems to melt/soften at room temp… Am I not making it stiff enough or am I putting it on to thick? In my recipe I use equal amounts of butter to High Ratio Shortening. Hi Rose, I would like to see your complete recipe and method before I can give you my recommendations. Have you tried our butter cream recipe? I have not tried your BC recipe because I am new to this and just found your sight, BUT I will now. This is the recipe I have been using this butter cream recipe. 4-6 Tbls of of lightly salted water. 2)Add meringue powder, & all flavorings. 3) Mix on low to combine. 4) Add powder sugar …gradually mixing on low, scrape the bowl as needed..
5)Gradually add salt water, continue on low speed 1-2 minutes until combined, scrape bowl & give a final mix. This recipe is from the US Baker The Cake Boss, I I can`t seem to get it to work for me!! This butter cream just seems to melt under my fondant even though I refrigerate/freeze my cakes. By the time they get to a venue…My nightmare begins!!! They look all lumpy & bumpy… NOT GOOD for BUSINESS!! What type of chocolate do you like to use for this technique? I tried melting chocolate to practice with and I was not too successful. The surface was not as smooth as I had hoped. Perhaps I didn’t thin it enough? You can use any chocolate for this purpose. Just make sure cake is cold. If you have problem with chocolate add 5 present oil to make it a little more runny. After using the chocolate do you cover the cake with buttercream before applying the fondant? Hi Dolly, Yes, basically mask the cake AFTER the chocolate. You can use either butter cream or ganache etc. 2. Crumb coat (sometimes not needed). 4. Mask once (butter cream or ganache). 5. Fridge for 5 to 10 minutes. 6. Mask a second time to make it smoother (sometimes not needed). This is such a helpful article. Thanks so much! Sorry I am a little confused…why aren’t you allowed to use ganache in Caboolture? I am a home registered business I tried to send a explanation to the heating of ganache but it still remains a no this is what I got sent back- from my council ..
All home kitchens are restricted to the manufacture only low risk (non-potentially hazardous) food and this is stated in Condition No. 8 of the covering letter when your food business licence was issued (the condition states that high risk foods such as cream, custard and meat must not be used). Council has sought advice from Queensland Health regarding homemade ganache. The advice received is that ganache is a potentially hazardous food and temperature control is required to minimise the growth of pathogenic micro-organisms that may be in the ganache and to stop the formation of toxins in the ganache. In summary, homemade ganache cannot be made or used in your home kitchen for your food business and Condition No. 8 remains unchanged. Sorry to hear that you can’t use ganache at home. I am not going to challenge Council regulations and I respect that the health and safety issues are important and rules must be made black and white to avoid miss understanding for every level of knowledge. I would like to make some comments based on personal experience and as a professional opinion. Ganache means melted chocolate in boiling cream. If you make ganache with a 1 to 1 ratio with chocolate and cream, it will be quite soft and will be risky to keep in room temperature especially if it is not produced properly. However, If you make ganache with 1 cream and 2 chocolate ratio, and the cream is boiled well, and clean utensils and good hygiene is used all the way. This cream can be kept in an air conditioned environment for a few days with no problem. As council indicates, it is a POTENTIALLY hazardous matter and everybody must make there own decisions and take their own responsibility. what about using a pre manufactured ganache. they can be bought at most cake places or wholesalers… the other ganache recipe I use to use is butter chocolate ganache..
What about a Ganache made with chocolate and butter? I’ve made it, and even pour it over simple mud cakes. just found this info for the council.. Copyright © 2000 Sarah Phillips Sarah Phillips, Inc. All rights reserved. Poured and Whipped Chocolate Ganache Tutorial RecipeWhether you know it or not, that creamy, delicately flavored chocolate stuff found in the center of a rich truffle is called ganache. You may also recognize it as a glaze on a cake, as a whipped filling or frosting or as a piped decoration. SARAH SAYS: In French, the term “ganache” means fool. The story goes that it originated in It originated in France around 1850, from a mistake that a chocolatier’s apprentice made, causing the chef to call him “ganache”, when he spilled cream into liquid chocolate that he was stirring. All ganache starts out with a rich mixture made from varying proportions of chopped chocolate and boiled heavy pasteurized cream or a liquid, cooled to various degrees of temperature and mixed in certain ways, yielding different uses. Ganache can be flavored, have extra ingredients added, such as butter for richness, and corn syrup for shine and flow properties! SARAH SAYS: So, to make thick ganache (used for tart filling, truffle centers, and as filling and/or icing for cakes and cupcakes), you add less cream. To make thin ganache (used for glazing cakes and pastries), you add more cream. Hatching Birdie Chocolate Truffle Pops TutorialAt first glance, it appears that ganache is a simple mixture of just two ingredients, heavy cream and chocolate. But, there’s a lot more science going on behind the scenes to give you a successful ganache mixture that won’t separate, become grainy, hard, crack, curdle or too firm. Ganache is a really a complex combination of an emulsification and a suspension that occurs between the chocolate and cream ingredients. An emulsification is a suspension of small globules of one liquid in a second liquid with which the first will not mix, ie: an emulsion of oil in vinegar or cream is an emulsion of butterfat in water. A suspension is a material in which a substance is dispersed in a liquid in clusters or particles consisting of many molecules. Nonfat milk is a suspension of milk-protein particles in water. The continuous phase of the mixture, or the “appearance” of its molecules or matter (ie: solid, liquid or gas), is a syrup made from the cream’s water and the chocolate’s sugar. Suspended in the syrup are the milk are the cream’s fat globules and the cocoa butter’s fat droplets and solid cocoa particles from the chocolate. To emulsify the chocolate and cream, the cream is first heated which reduces its water content. The hot cream is poured over the chocolate and it melts after sitting for a few minutes. The waiting time also serves to bring down its temperature down because emulsions form better at 90 degrees to 110 degrees F. Start slowly, and then rapidly mix the ingredients together in ONE direction, starting from the outside edge moving inward. The emulsification takes place by the combination of work or stirring, which breaks down the fat in both the cream and chocolate into microscopic droplets, small enough to be suspended within the water – and the use of an emulsifier to stabilize the system, or fatty acids present in the cream or milk. 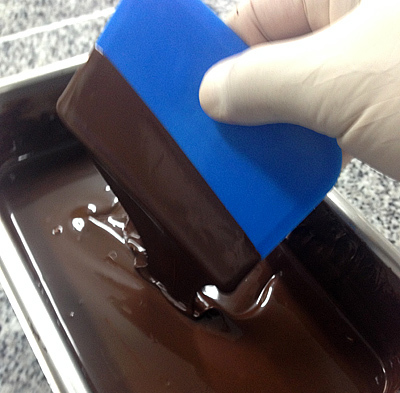 As a general rule, the higher the fat content of the cream, the richer and more stable the finished ganache will be. (The milk solids in the cream also help thicken the ganache and the butterfat lends smoothness and moistness). I like to use heavy whipping cream to make ganache. Even crème fraîche or sour cream can be used instead of heavy cream. SARAH SAYS: I have successfully made ganache with soy milk. SARAH SAYS: I recommend using a high quality dark chocolate, such as Valhrona or Dove, but find a chocolate you like and stick with it. If using milk or white chocolate just note that they are more temperamental; they contain milk or milk fat, unlike dark chocolate, making them more susceptible to damage from heat. Because of the milk, they also make “softer” ganache, so lessen the amount of cream used. Once made, ganache needs to thicken if it will be used for anything other than a glaze. First cover with a piece of plastic wrap pressed on the top of the ganache so a film does not form, then chill the mixture in the refrigerator until it becomes thick but not firm, which takes about an hour, depending on how large or deep the storage container is.The mixture can also be set aside at the cool side of room temperature to thicken, but this takes longer than chilling in the refrigerator. Whipped ganache: is used for making truffles, piping, filling or making a mousse. After making, it needs to cool to lukewarm so it thickens and will whip faster and have a better texture. Be sure the ganache is soft before beating, or it will break and curdle. Then place ganache in a mixing bowl and whip it vigorously by hand or with an electric mixer fitted with a flat beater attachment, starting on low and progressing rapidly to medium-high speed. Do this until mixture has lightened in color and is fluffy. Do not overwhip, otherwise it will become grainy. If it does, reheat the ganache in a double boiler and strain. Ganache Icing: My favorite flavorful chocolate frosting is made by placing a piece of plastic wrap on the surface of the ganache. Store at room temperaturefor for an hour or longer, depending on the recipe – not in the refrigerator because the ganache will get too hard. Then, whip with your mixer and add 1 stick of softened butter, a tablespoon at a time. Add in 2 cups of powdered sugar slowly at the side of the bowl with the mixer running on low until the ganache is smooth. If the ganache is too stiff, add a small amount of cream, if necessary. Poured and Whipped Chocolate Ganache Tutorial RecipeGanache Glaze: Ganache can be poured like a glaze on cakes that sets with a beautiful shine and smoothness, and also seals in freshness. You can tell if a cake has been glazed with it because it has a glossy and smooth chocolate surface. After making, let cool slightly and use immediately as a glaze. HOW TO GLAZE BAKED GOODS. To make: I always double the recipe in case I need extra. Four cups is enough to glaze an 8-inch cake. For pouring, the ganache mixture should be approximately 86 to 91 degrees F measured with an Instant Read Thermometer (Stir the mixture before inserting the tip of the thermometer in the center of the mixture making sure you don’t touch the bottom or sides of the bowl) or feel just slightly warm — it must remain pourable — it should look and pour like corn syrup in order to glaze the cake or a frozen dessert. If ganaching a chilled mousse, it should be chilled thoroughly so the ganache will set quickly and not melt it. If the ganache is too hot, press a piece of plastic wrap on the top of the ganache so a film does not form and allow it to sit at a cool, room temperature until just thickened, about 15 minutes, or so. Be careful so it does not cool too much. Infuse flavor to hot cream: Infuse herbs and spices, such as lavender, into the cream after heating. Then, strain before using. Add flavor to cold cream: Mint, coffee beans and tea leaves. Chop and blend into the cold cream, and allow to sit overnight. Strain the pieces from the cream when ready to heat. Add flavors to the ganache: Liqueurs, brandies, extracts, fruit purees, instant espresso powder, spices. I like to use Armagnac, a kind of dry brandy. Add when the warm ganache has been blended and is smooth. Add texture to the ganache: Add chocolate nibs after the ganache has been blended and is smooth. After making and for storing, always place a piece of plastic wrap firmly against its surface so a film does not form or it won’t form a sugar crust on its surface. Classic ganache can generally stay at room temperature for 2 days, as long as it’s kept in a cool place, and then it must be refrigerated, where it can stay for up to a month. Let it stand at room temperature to warm up. But, there are lots of exceptions to this rule. Ganache can be frozen for a month or more. Thaw in the refrigerator, and then let stand at room temperature to warm up. Ganache is perfect to use for a cake or wedding cake that has to sit out for awhile– to store, place under a covered cake saver or inverted bowl so as not to mar its surface. SARAH SAYS: The storage topic about chocolate ganache is debatable. Every ganache recipe varies, and a blanket statement cannot be made as to whether it needs refrigeration or not. The final determination is made by what the recipe is, how it is made, how it is being stored, how long it is being kept for, and how it is made. Because of its high content of sugar and fat, some feel that ganache needs refrigeration after two days IF made properly, which baking911.com endorses. If not made properly, it needs refrigeration right away, to which we agree. But, how do you know? You don’t. To be on the safe side, baking911.com recommends keeping our ganache recipes at room temperature for two days, and then refrigerating for the remainder of time. Storage information is included with all of our recipes. Thank you for that tip, I have never thought to use that before, but will from now on.